Tougher sanctions for illegal parking will come as a surprise to many. Beginning July 1, parking on the sidewalk or in a crosswalk in the center of Moscow or St. Petersburg will result in a fine of 3,000 rubles ($90) rather than 300 rubles ($9). Violating other rules regarding standing or parking will incur a fine of 2,500 rubles ($75), up from 100 rubles ($3). While the government can be praised for tightening sanctions on illegal parking, the new fines do little to solve the bigger problem – the lack of parking in the center of Russia’s two major cities. At the same time, fines for illegal parking in Russia’s other cities remain unchanged and the information campaign regarding the new fines has gone practically unnoticed. "For non-residents who come to Moscow, it will be a shock," said Vyacheslav Lysakov, leader of the Freedom of Choice movement of motorists. Since April, the Department of Transportation has been distributing yellow leaflets with a red inscription reading "3,000 ruble fine" to those who have committed a parking violation, notifying them of the increase in prices as of July 1, and before July, another will also be passed out, according to Transportation Department spokeswoman Zhanna Terekhova. The authorities claim that 35,000 such warnings have been distributed, but few drivers admit having seeing one. Motorists argue that the lack of information gives the impression that the city wants to fill its coffers at the expense of drivers. According to statistics, in Moscow’s Central district, where most Muscovites work, 35 percent of drivers – some 54,000 people – regularly choose illegal parking spots. Parked cars on some sidewalks in downtown Moscow sometimes create impassible barriers for pedestrians, who often find themselves fenced in by a densely packed chain of cars. There are 240,000 legal parking spaces in the center of the capital, and according to Maxim Liksutov, head of the Moscow Department of Transport, this is the absolute limit. However, many of these parking spaces are in lots restricted to employees of government agencies, and these half-empty lots adjoin streets that are filled with rows of illegally parked cars. The failure of previous attempts to bring order to the parking situation lead motorists to believe there is not much hope that the latest effort will succeed either. "Tverskaya Street was cleaned up so that no one dares leave their car there, even in special turnouts. And Bolshaya Dmitrovka, which is parallel to it, is packed, but no one drives motorists away from that street. Recently they have been chased away from Pushkin Square, although there it is possible to park without disturbing anyone," said Vyacheslav Lysakov, giving examples. Driver Olga Zhelezyak also doubts the system will work: "My question is: how will it function? I doubt very much that everyone will be fined, because we have, after all, emergency lights and cars with various permits on the windshield. " 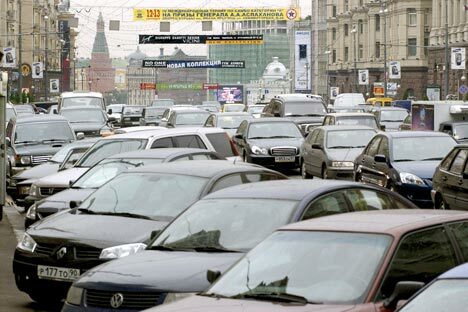 According to Lysakov, increased fines represent a repressive measure, which should be the last step in a series of measures to improve the transport situation: "First we need to arrange for park-and-ride lots and comfortable public transport. Create additional parking spaces. And then fine those who ignore all these measures; do not fine selectively or automatically everyone,” Lysakov said. Fines are given out manually by parking inspectors as well as assessed automatically using the "Parkon" parking control system, which is mounted on 10 vehicles that travel around the city. By July, there will be 100 such vehicles. But according to experts, this number is still not enough for all offenders. First published in Moskovskie Novosti.